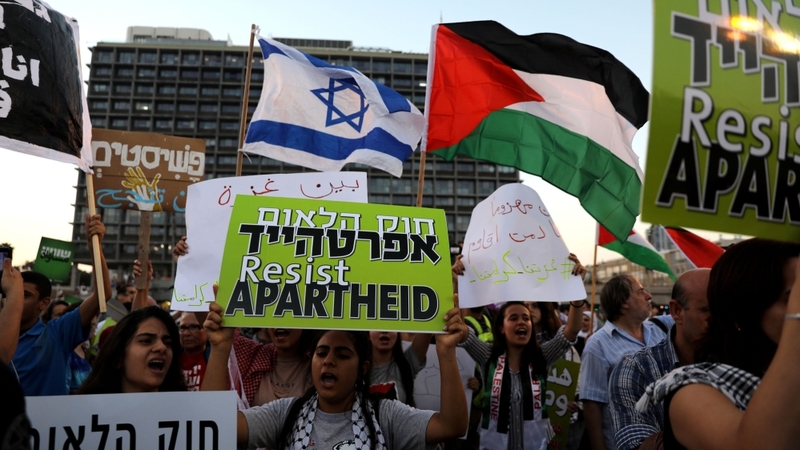 Tens of thousands of people including Jews and Arabs rallied in the Israeli city of Tel Aviv to protest the country’s controversial “Jewish state law”. Passed last month, the divisive law officially affirms Israel‘s Jewish character, but critics say it turns non-Jewish citizens of the country into second-class citizens, further marginalising some 1.8 million Palestinians with Israeli citizenship and other minorities. The protesters marched through the streets of the city on Saturday night calling for the law’s cancellation. “This is amazing. This is the first time I remember Jews and Palestinians fighting together for something. This is a really big moment for people that believe in democracy and equality,” an unidentified demonstrator told Al Jazeera. The “nation-state bill” also establishes Israeli settlements in the occupied Palestinian territories as a “national value” that the state must encourage. “This law is against us, against the Arabic language, against peace, against our future in this land. We are the real people of this land,” said demonstrator Omar Sultan. “We have anti-democratic moves taking place in many things – towards gays, towards women, towards secularism, and towards Palestinians. This is turning into a fascist regime,” a protester told Al Jazeera. The Druze are an Arabic-speaking group with their own distinct religious and cultural traditions. They make up two percent of Israel’s 8.8 million population, and are found mainly in the northern regions of Galilee and Carmel. The Druze have had special status since the 1950s when they were drafted into the military, unlike Israel’s Muslim and Christian populations. Netanyahu has repeatedly defended the contentious law passed on July 19. “We will keep ensuring civil rights in Israel’s democracy but the majority also has rights and the majority decides,” he said a week before it passed. Those who remained have full equal rights under the law, but face constant discrimination, including inferior services and unfair allocations for education, health and housing.